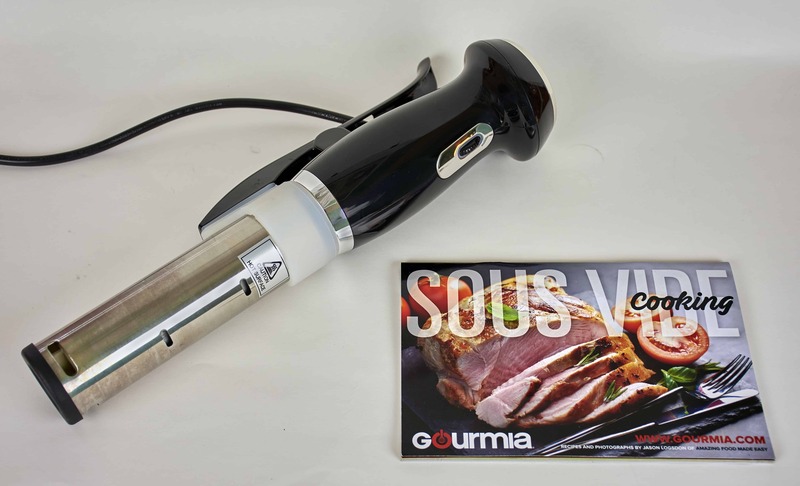 Disclaimer: Gourmia provided us a free Sous Vide Pod to test for this review. 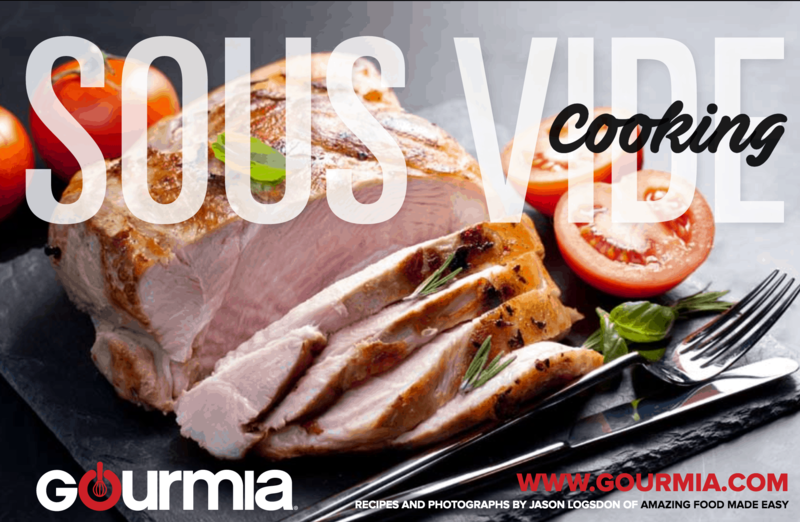 We also have a business relationship with Gourmia in which they are using recipes and photographs from Amazing Food Made Easy as important components of their sous vide product offering. That said, we pride ourselves on providing objective, nonbiased, reviews on everything that we evaluate. Gaining and maintaining your trust is our most important goal. "Designed for cooks who want to make easy, healthy and delicious meals every week, not only on special occasions and holidays. With decades of small appliance expertise, Gourmia's founders know that cooks are looking for dependable, easy-to-use tools that will make their lives easier. From sous vide immersion cookers to multi-purpose cookers and juicers, the team at Gourmia has taken input from chefs and consumers to make their products the best in their category. All of the company's products are designed to deliver a higher standard of innovation, performance, and value." 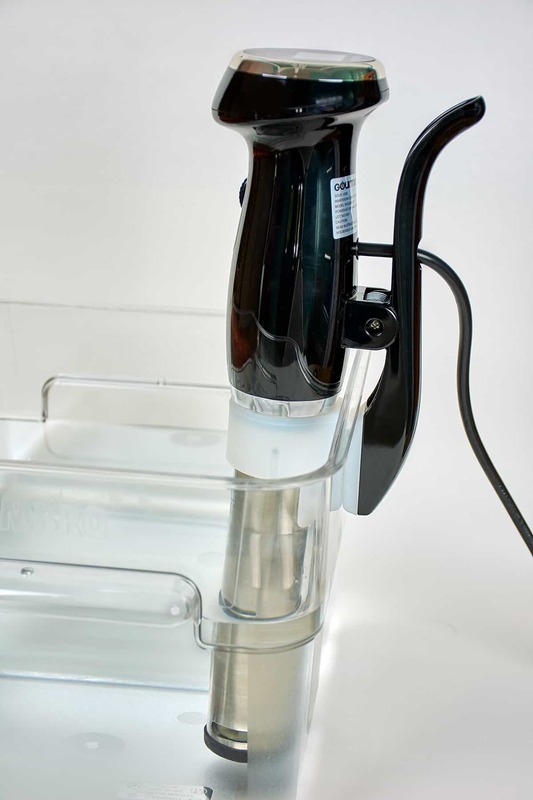 Near the end of 2015 they released this low-cost immersion circulator which, when attached to a suitable container, will provide an excellent water bath for sous vide cooking. If you are interested in getting involved with sous vide cooking, this review will give you all of the information you need to determine if the Gourmia is the right immersion circulator for your needs. If you're not into details you can go directly to my Gourmia Immersion Circulator Summary and catch the summary of my analysis. Long before top chefs in the United States started using sous vide cooking in their high-end restaurants, it was a mainstay of the culinary scene abroad. Today sous vide's popularity among fancy eating establishment, every day restaurant and home cooks continues to rapidly climb. Once you experience the ease of achieving consistent food quality, there is no going back. It may seem intimidating but it only takes a little bit of knowledge to understand the differences between sous vide and traditional cooking concepts and equipment. Are you new to this method? You can get a quick start by reading our Beginners' Guide to Sous Vide for a comprehensive overview. Ready to discover even more about cooking sous vide? Sign up for our FREE in-depth email course, Exploring Sous Vide. Happy cooking. Now let's get started with the Gourmia review! The chart below lists the basic specifications for the Gourmia. Please refer to this as necessary as I highlight some of the specifications. Gourmia is a tube 2.00" (5.08 cm) around and 14.5" (36.8 cm) tall. It weighs 2.3 lbs (1.0kg). This makes it similar in size to other popular immersion circulators. It is slightly lighter but essentially takes up about the same amount of room in your kitchen drawer or cabinet. For comparison sake, here's is an image of several circulators. From left to right is the Nomiku (weighs 2.7 pounds), the Gourmia (2.3 pounds), and the Anova Precision Cooker (2.5 pounds). Similar to all immersion circulators the Gourmia has a minimum level indicator which requires the water in the bath to be above it and a maximum level indicator which requires the water to be below it. Each of these levels has an associated sensor which will shut the unit down if the water level is not between the two sensors. Although most people don't pay much attention to the location of these indicators, they may have a significant impact on the usability of the circulator. Moreover, the distance between the two indicators is perhaps the most important parameter. Typically the spacing between these two levels on most circulators is around 3.5" (8.89 cm). Unfortunately, the spacing between these indicators on the Gourmia is only 2.125" (5.4 cm). Only the Nomiku has a smaller spacing at 1.25" (3.18 cm). This requires that the user be much more attentive to carefully watching the water level during the cooking time and makes some type of lid required for longer cooks. For example, on a long sous vide cook in a moderate size uncovered water bath the level could easily drop below the minimum level several times. This would require the user to regularly monitor the water level and add water when necessary. Another possible problem could arise at the beginning of a cook when you have filled the water bath so the level is above the minimum marking and heated the water to the target temperature. Then if you were to add numerous items to the bath to be cooked it's possible that the water level could rise above the maximum level. Clearly this is not a showstopper, but it does require the user to more closely monitor the water level, and most likely use a lid, since there is much less of a margin for error than with most other circulators. The Gourmia uses a sturdy spring-loaded clip with a silicon grip very similar to the Nomiku. The biggest advantage to the clamp is that it's very easy and quick to attach the unit to the side of the water bath. It is also possible to use it on a wide variety of water bath containers. The clamp does not open quite as wide as most other circulators which might eliminate using the device on a container with a thick side such as an ice chest. Although I didn't experience it, I have read occasional complaints from users that the clamp slides down the side of the container during the cook, which could potentially cause problems. The Gourmia appears to be reasonably well built and should be durable. The top of the unit is made of sturdy polycarbonate and the portion in the bath is stainless steel with a plastic cap on the bottom. In the initial version of this review I mentioned that the Gourmia did not have a way to access the internal workings of the device for a thorough cleaning. However, the folks at Gourmia contacted us to let us know that there was a way to clean the internal workings. "To accomplish this, the clear rubber that is around the stainless tube needs to be pulled down. This will expose a Philips screw that once you remove you can take off the SS tube to clean the elements." How Much Does the Gourmia Circulator Cost? Over the last few years the popularity of sous vide cooking has increased significantly. This is due in large part to the availability of low cost, high quality, immersion circulators. Fortunately for sous vide enthusiasts like us, the competition in this market has really heated up. In addition to the Gourmia GSV130 Digital Sous Vide Pod, Anova , Nomiku and Sansaire have also brought inexpensive immersion circulators to market. Taking a different approach Sous Vide Supreme and Caso provide a dedicated water bath. All of these companies are competing to obtain market share in this growing movement. Gourmia has aggressively priced its immersion circulator at $130 making it the least expensive way for a user to experience sous vide cooking with an immersion circulator. Clearly, this low price has been the feature that has attracted many users to this Gourmia circulator. The primary function of a sous vide water bath is to maintain a precise low temperature during the entire duration of the cooking cycle, which could be minutes or days. There are numerous factors that go into determining how well the Gourmia performs this function. I will cover those in this section and highlight some of the similarities and differences between the Gourmia and other immersion circulators. Please refer to the chart below as needed as you read through this section. Let me first say that Gourmia has a dearth of detailed specifications for their unit on their website or on any other product documentation. So in some cases I have had to gather this information simply from paragraphs on their website, mentions in press releases, or mentions in their product videos. And in some cases the parameters mentioned I believe are much more conservative than the unit can actually handle - which is not something that you often see! The Gourmia has many characteristics are similar to other immersion circulators. The Gourmia covers a temperature range which is adequate for all sous vide cooking and the accuracy is comparable with other units. The maximum temperature setting is 203°F (95°C). The Gourmia literature often mentions using it in a 3.5 gallon (13.2 L) pot. However, in the manual, as well as in one video it mentions that it will work in water bath containers up to 5 gallons (18.9 L). In neither case are the parameters defined as the maximum that you can use. But from what I have seen, I would suspect that the Gourmia can handle water bath capacities similar to other sous vide immersion circulators in its class. The Gourmia literature plainly states the pump can circulate up to 1.5 gallons (5.7 L) of water per minute. Personally, I believe this specification is quite conservative for two reasons. The first is that the impeller on this unit is the largest of any that I have seen. And second, that from just viewing the unit in action it appears to be moving the water in the bath more than most other units. At any rate, the pump is certainly adequate to keep the temperature in the water bath relatively constant. The results of the benchmark show that the Gourmia is the fastest at raising all three of these temperatures. It even beats the PolyScience Pro Creative Series and is more than twice as fast as the Anova Precision Cooker. As an example, if you are like me and typically leave your water bath and immersion circulator ready to go on your countertop, it will take the Gourmia approximately 16 minutes to reach a cooking temperature of 140°F (60°C). It would take the Anova Precision Cooker, Nomiku, and Sansaire immersion circulators 35, 27 and 21 minutes respectively to achieve the same task. Many people start their cooking with hot tap water, but for those who reuse water, or who's tap water doesn't get hot, the extra heating speed can be a great benefit. What Do Others Think of the Gourmia? Since the immersion circulators are all sold on Amazon it is a valuable resource to determine what other users think of the unit they purchased. The Gourmia immersion circulator is rated just above 4 stars with approximately 75% of the users rating it a 4 or 5 star. 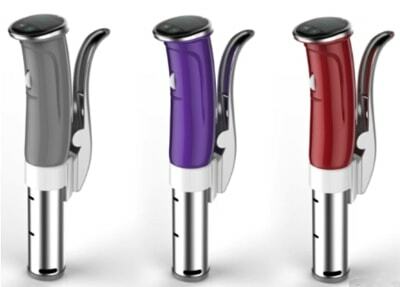 At the time of this writing there were 177 customer reviews on Amazon for the Gourmia GSV130 Digital Sous Vide Pod with a rating of 4.1. This compares to a rating of 4.4 (1265 reviews) for the Anova Precision Cooker , 4.6 (525 reviews) for the Anova One and 4.4 (197 reviews) for the Sansaire Immersion Circulator . The unit worked well for the majority of the reviewers and most were ecstatic about the results they were getting with sous vide cooking. There were two problems that were mentioned in a few of the reviews. The first issue was that occasionally the unit would break in some fashion relatively soon after it was put in use. The folks at Gourmia have told us that the issue with the units failing early on has been solved. Apparently it was caused by a small amount of moisture condensing in the control section. They have now improved the way the electronics are sealed. To a lesser extent other reviewers complained about the black plastic cap at the bottom of the circulator coming off. I could relate to this issue since that happened to me as well. It just took a little patience to replace it on the unit. Besides those two issues, almost everyone else had high praise for the Gourmia. As another point of reference, I took some time and looked at many of the other products manufactured by Gourmia and sold on Amazon. It was quite rare to see a rating less than 4 stars. This helps indicate that the majority of Gourmia's equipment is probably of high quality. The user interface of the Gourmia is comprised of a Control Panel with an LCD display and two buttons, as well as a rotating "Variable Time and Temperature Wheel". The Gourmia Control Panel is located at the very top of the immersion circulator and contains a large LCD display and two buttons. The current water bath temperature is displayed in large numbers, in either Celsius or Fahrenheit, in the middle of the LCD display. In smaller numbers in the upper right-hand corner of the display is the Set Temperature or target temperature. Also in smaller numbers in the lower left of the LCD display is the Set Time or how long to cook. And finally on the lower right of the LCD display and in smaller numbers is the Work Time or time unit has been cooking. Located immediately below the LCD display on the Control Panel are the "Power" button and the "Set" button. Finally, in the front of the unit, located slightly under the Control Panel, there is a rotating "Variable Time and Temp Wheel" used to adjust both the time and temperature in increments on the Control Panel. I would not call the Gourmia immersion circulator user interface very intuitive. I say this because there are numerous operations that can be done with the immersion circulator and all of these must be accomplished using only the two buttons and the rotating wheel as inputs. This means that you must resort to somewhat unintuitive actions such as pressing and holding buttons, pushing both buttons at once, or progressing through a sequence of actions. However, once you read the directions and go through the actions one time, they are relatively easy to remember and repeat. In order to start a sous vide cook you simply clamp the Gourmia to the side of your water bath and fill it with water so that it's between the Max and Min indications on the unit. Then plug the unit into a three-pronged outlet and the Control Panel lights up and the unit beeps once then goes dark. You then press and hold the Power button for 4 seconds and the unit will power up, lighting up the LED display on the Control Panel with the current water temperature flashing. The unit always comes up displaying temperatures in Celsius. If you want to use Fahrenheit you can press the Power and Set buttons together for 2 seconds and the temperature units will switch. Unfortunately, if you prefer working in Fahrenheit degrees you need to do this every time you power the unit on, which can be a hassle. At this point you can also adjust the Set Temperature by scrolling the wheel on the front of the unit. If you are working in Celsius you can adjust the temperature in increments of 0.5°C; if working in Fahrenheit you can adjust it to increments of 1°F. The maximum temperature setting is 203°F (95°C). If you would like to set the cooking time you can push the Set button one time and the two hour digits on the Set Time display will flash. You can then use the adjustment wheel to set the hours. Press the Set button once again to set the minutes. The Set Time can range from 00:00 to 59:59. If the Set Time is not entered the unit will operate indefinitely. Once you've made all your settings you press the Power button and the unit will begin to heat and circulate the water. When the water temperature reaches the Set Temperature, the alarm will beep 3 times every 3 seconds, indicating the food should be added to the water bath. This beeping will continue incessantly until you cancel it by pressing the Set button for 2 seconds. Personally, I am not a big fan of this design decision. I typically put my food into the water bath before it reaches the set temperature. So I am normally off doing other things, if I am in the house at all, when the target temperature is achieved. Therefore, it's a nuisance to have to come back to the kitchen just to shut off the notification. I would suggest that a few beeps total would be sufficient. Once you press the Set button to turn off the alarm, the Work Time will begin recording the duration of the cook. When the timer counts down to the Set Time, the unit will sound the alarm every 3 seconds. It informs you to take out the food. Once again you need to cancel the alarm by pressing the Set button for 2 seconds. To turn the Gourmia immersion circulator off, hold down the Power button for 5 seconds. 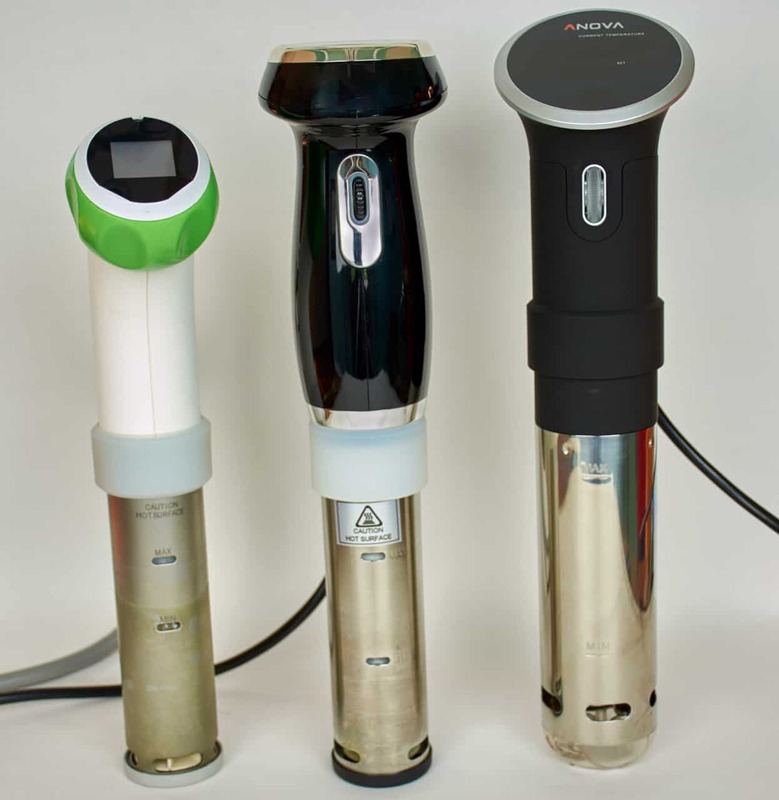 Many of the low-cost immersion circulators are being purchased by people new to sous vide. Manufacturers have taken different approaches to assisting these new users to become comfortable with sous vide cooking. Some have information and recipes on their website, others have gone high-tech and provide information and recipes via a smartphone app. In the latter case it's sometimes possible to have the recipe "automatically" set the time and temperature in the immersion circulator appropriately. Gourmia decided to go with the time-honored approach of a recipe book. They partnered with us at Amazing Food Made Easy and we provided the recipes and photographs in the book. The book contains many of our favorite recipes for steaks, fish, vegetables, eggs, poultry, duck, pork, brisket, and desserts. This wide variety of easy-to-make recipes will demonstrate to the new user the many ways sous vide can be used to create amazing meals. But the greatest value in the book is in the latter half which contains time and temperature recommendations for hundreds of different types of foods and cuts. This is the most exhaustive list of time and temperature information we've seen in any immersion circulator to date. 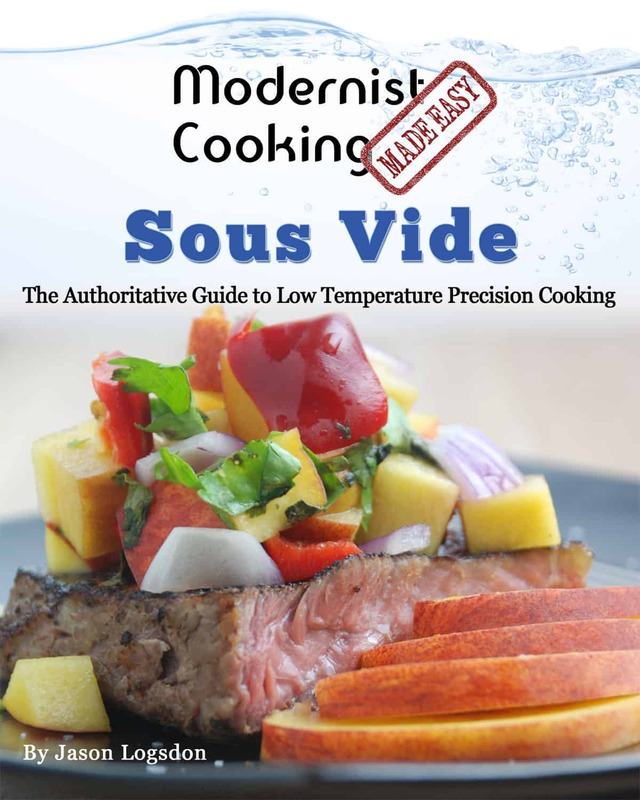 You can take a look at this Gourmia Sous Vide Cooking Book on the Gourmia website. While we are biased because we helped put the book together, we tried to include the information we felt was most important for new sous viders to know. The Gourmia is a bit more stylish than some immersion circulators that looked more like laboratory equipment. The unit is available in three colors: black, white and bronze. One of these might be a better fit with your current kitchen decor. The selection of materials used in, and the construction of, the Gourmia immersion circulator make it look and feel like a well-designed and well-built kitchen appliance. Overall it was quite easy to set up, cook with, and store afterwards. Unlike some of the immersion circulators you cannot access the submerged portions of the device for easy cleaning. As I mentioned above, in my opinion, this is a shortfall of the Gourmia design. For me one large downside of the Gourmia design is that when it is clamped in place the Control Panel faces directly upwards. Since I use a wheelchair this means I cannot see the control panel when it's in place. To use it I had to un-clamp the unit, while still keeping part of it in the water bath, and try to angle it such that I could access the Control Panel. This would usually work, but occasionally would shut down the unit due to either the Max or Min errors occurring, This obviously wasn't convenient. Many users will not be affected by this design decision, but it will be an issue if you are small in stature, would like to teach your children to cook sous vide, or usually have your sous vide machine on a higher counter. In a March 2016 press release announced that they would be releasing a new WiFi and Bluetooth enabled sous vide pod in the latter half of 2016. This new immersion circulator will be accompanied by a smartphone app that will allow you to control the pod from a remote location. The mobile app will also include sous vide recipes from Jason Logsdon at Amazing Food Made Easy. They project the price will be $200 and be available in three colors. This is quite an additional increase in cost associated with the WiFi feature. If you are wondering whether you might want to upgrade to a WiFi model we can help you with that with our article on, Do I Need a Sous Vide Machine with WiFi? If you don't think WiFi is for you, then it's probably not worth the wait or extra cost for the new unit. Keep in mind that Anova, Nomiku and Chefsteps will also have WiFi enabled immersion circulators available in that same timeframe at approximately the same price point. Most of the sous vide solutions available in the market will provide the capability, capacity, and accuracy most of us need to successfully cook sous vide. We are all in that enviable position that it would be hard to make a "poor" purchasing decision. Clearly the greatest differentiator for the Gourmia GSV130 Digital Sous Vide Pod is its entry-level pricing and higher power. I think it's great that adventurous cooks can try out sous vide cooking with a quality device with only a $130 investment. That will allow many more people to enjoy the benefits of sous vide cooking. I find it remarkable when thinking back to when I first began to cook sous vide, that an immersion circulator with the capability similar to the Gourmia, would cost nearly 10 times as much as it does today! I believe the Gourmia immersion circulator is the ideal product for those folks on a tight budget that would love to try sous vide. The Gourmia does not have some of the bells and whistles of other units, such as Bluetooth, WiFi, and a smartphone app. However, it clearly does have all of the functionality required for the vast majority of sous vide cooking at an extremely competitive price. The category-leading power of the Gourmia, which reduces the time to reach the target temperature, also makes it a fit for impatient sous viders. 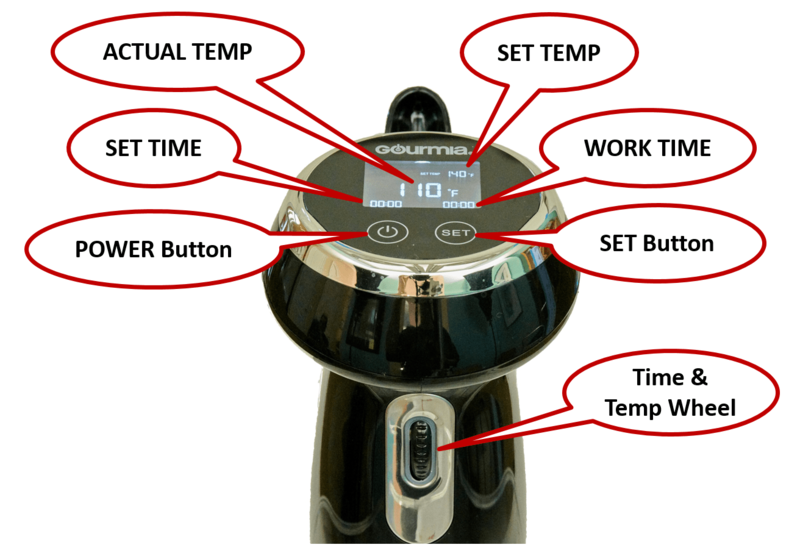 I hope this review of the Gourmia Sous Vide Pod has provided you with the information you need to make a well-informed purchasing decision regarding a sous vide immersion circulator. I encourage you to explore the site for reviews of other sous vide machines. If you do purchase an immersion circulator you may be interested in looking at our reviews of Sous Vide Water Bath Containers. If you have experience with the Gourmia GSV130, I would appreciate you sharing it in the comments below. Thanks.